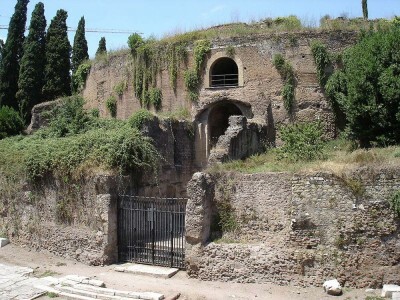 The Mausoleum of Augustus is one of the Roman historical sites located in Pinciano district. This Mausoleum is a grave which was built by the Emperor Augustus for his family members. Built in 28 BC, it was the burial place of several members of the Imperial family including Augustus himself. Later on, building mausoleums became a trend and each emperor tried to follow it. The Mausoleum of Augustus features some of the Europe’s most spectacular ornamentation. The tomb is a circular structure that has several stories. It has a diameter of 290 feet and is about 145 feet high. It consists of four layers of concentric circles that are covered with soil. The thickness of the outer circle wall is 16 feet and it is made of marble. In the center, a funeral chamber was reserved for the Emperor. Between the inner and outer walls, there are a number of enclosed chambers for the members of the royal family. Cypress trees are planted all over the bottom layer of the tomb. A large bronze statue of Augustus is on the top layer of the monument. On both the sides of the bronze entrance door there are two obelisks. These obelisks were brought from Egypt. Many emperors were buried in this famous Mausoleum. Marcellus, Augustus’s nephew was the first person to be buried in the mausoleum. Others buried here include Augustus, Agrippa, Octavia, Drusus the Elder, Cauis and Lucius Caeser, Livius, Tiberius and Agrippina. The last person to be buried in the mausoleum was Emperor Nerva in 98 AD. The monument served as an imperial burial place until the era of Trajan. Then, the Trajan Column was built to bury Emperor Trajan. Trajan’s successor, Hadrian built a new mausoleum, known as Castel Sant’Angelo. The Mausoleum remained intact until the 5th century, when barbarians smashed the bronze gates and stole the golden urns. Today only the brick core is left of what was once one of the most scared monuments in Rome. The ruins are overgrown with plants. Later on it was converted into a vineyard and then into an auditorium. Today, you are not allowed to enter the monument, but you can walk along the four streets encircling it.